Manjushri Bodhisattva（sanskrit：मञ्जुश्री ） is also called Wonderfully Auspicious Bodhisattva. He is one of the four great bodhisattvas in Buddhism. He is the left assistant bodhisattva beside Shakyamuni Buddha. Manjushri Bodhisattva represents intelligence and wisdom. Because of his outstanding virtue and talent, he is the leader of bodhisattvas and also called Dharma prince. The meaning of Manjushri is wonderfully aupsicous. Manju means wonderful, elegant and lovable. Sri means auspicious, beautiful and stately. Manjushri bodhisattva was born to a Bhraman family in Doro village of Sravasti City in 6th century BC. His father’s name was Fan De. His mother gave birth from her right side of her body. Manjushri’s body was born purplish golden in color. He could speak since birth. He has a seven-jewel canopy covering his head like a heavenly being. Manjushri has 32 major marks and 80 secondary characteristics just like the Buddha. In the Enter the Dharma Realm Chapter of Flower Adornment Sutra, Maitreya Bodhisattva told Youth Good Wealth “Manjushri has great vows! His vows are unrivaled by countless hundreds, thousands, millions of bodhisattvas. His conducts are vast and his vows are boundless. He brings forth all bodhisattva’s merits and virtues. Manjushri never stop and rest. He is the mother and teacher that nourished and educated countless buddhas. He teaches and transforms all living beings and his name is well known across worlds of the ten directions. In Mahayana Buddhism Manjushri is the leader of all bodhisattvas. He often accompanies Universal Worthy to assist Buddha closely. All disciples of the Buddha respect Manjushri has the icon for wisdom. Prajna is the mother of all buddhas. Manjushri is the teacher of the past seven buddhas. The Manjushri Bodhisattva statue we commonly see today has a five-level cowl on his head. This five-level cowl presents the five types of non-surpassed, non-attainable wisdom. The five types of wisdom are: 1. The Wisdom of Dharma Realm Substance Nature 2. The Great Perfect Mirror Wisdom 3. The Wisdom of Equal Nature 4. The Wisdom of Contemplation 5. The Wisdom of Accomplishment. Manjushri Bodhisattva has lotus flower in his left. In the lotus flower there is a Prajna Sutra. Having a Prajna Sutra in lotus means Prajna is not contaminated by dust and it is like a great fire torch, non-touchable from all sides. If you touch the fire you get burned. Manjushri bodhisattva has a jeweled sword on his right hand representing great wisdom. The great wisdom can sever all ignorance and afflictions. 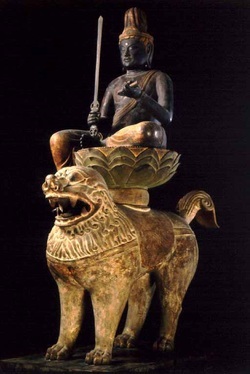 The great wisdom is symbolized by the Vajra Jeweled Sword that severs all demons. Manjushri Bodhisattva statue may sit on a lotus flower representing purity or on a lion or peacock representing power and might. 1. "Summit Shurangama Samadhi Sutra" : Manjushri Bodhisattva had attained Buddhahood in the distant past. The Buddha's name was Dragon Seed Superior Thus Come One. Many of his disciples had already become Buddhas as well. As a result, Manjushri was often referred as The Mother of Buddhas, the Teacher of Buddhas in sutras. To teach, transform and benefit beings by expedient means, Manjushri turns the ship of compassion around and presents himself as a bodhisattva. On one hand he assists Shakyamuni Buddha to propogate Dharma. On the other hand, he collaborate with Universal Worthy, Guan Yin, and Earthstore to cross living beings over. 2. "Laying Bowl Sutra" : Now I have attained Buddhahood with mighty, honored, 32 marks and 80 characteristics. I across and liberate all beings in the ten directions. I attained Buddhahood because of Manjushri's kindness. Manjushri was my teacher. Countless Buddhas in the past were all Manjushri's disciples. Those who will become buddhas in the future are because of Manjushri's great strength. The analogy is the same as world children having their parents. Manjushri is the parent in buddhahood. 3. "Sagely Non-movable Honored One Sutra" : Wonderfully Auspicious Bodhisattva is the mother of buddhas of all three times. Thus, he is called Manjushri." Even though Manjushri Bodhisattva had become buddha generations ago, he turned the ship of compassion around. He hid the great and manifested provisionally to be Manjushri Bodhisattva. Manjushri Bodhisattva is also known as Wonderfully Virtuous or Wonderfully Auspicious Bodhisattva. Why is he called Wonderfully Virtuous? 1. Bright light filled the room. 2. There was a rain of sweet dew. 3. The seven precious things welled up from the earth. 4. The treasures in the earth were revealed. 5. Chickens gave birth to phoenixes. 6. Pigs gave birth to dragons. 7. Horses gave birth to unicorns. 8. Cows gave birth to white zai (an auspicious kind of animal). 9. The grain in the granaries turned to gold. 10. Elephants with six tusks appeared. Usually elephants only had two tusks but now these particular elephants had six tusks. Manjushri bodhisattva had these ten amazing auspicious signs so he was also called Wonderfully Virtue. Because when Manjushri was born the ten auspicious signs appeared he was also known as Wonderfully Auspicious. Actually, this bodhisattva is no longer a bodhisattva. Who is he? He is a buddha. In many generations ago he has already attained buddhahood. He was Dragon Seed Superiorly Honored King Buddha. He had already become a buddha in the past. Has he attained buddhahood now? Yes, he has attained buddhahood now. In this present time he is Delightful Treasury Cintamani Jewel Assembly Buddha. This buddha's land is the Land of Delight in the northern direction. Manjushri Bodhisattva is Cintamani Jewel Assembly Buddha. Even though he has become buddha already, he turned the ship of compassion around. He hid the great to manifest the small to be Manjushri Bodhisattva. In Lotus Sutra, it revealed that Manjushri Bodhisattva was Shakyamuni Buddha's great grand master. How was Manjushri Shakyamuni's great grand master? Sun Moon Latern Brightness Buddha had eight sons. The last buddha of these eight boys was Lamp Bearer Buddha. Lamp Bearer Buddha's master was Master Wonderfu Light. Who was Master Wonderful Light? Master Wonderful Light was Manjushri Bodhisattva. Shakyamuni was Lamp Bearer Buddha's disciple. Lamp Bearer Buddha certified Shakyamuni so he became Buddha in the present generation. When we consider the lineage and seniority, Manjushri Bodhisattva is more senior than Shakyamuni Buddha. Because Shakyamuni Buddha is the present buddha, Manjushri came to be Shakyamuni Buddha's disciple instead.